IDF aircraft attack terrorist cell that fired incendiary balloons from northern Gaza into Israeli territory. IDF aircraft on Sunday evening carried out an attack on a terrorist cell that fired incendiary balloons from northern Gaza into Israeli territory, the IDF Spokesperson’s Unit said. 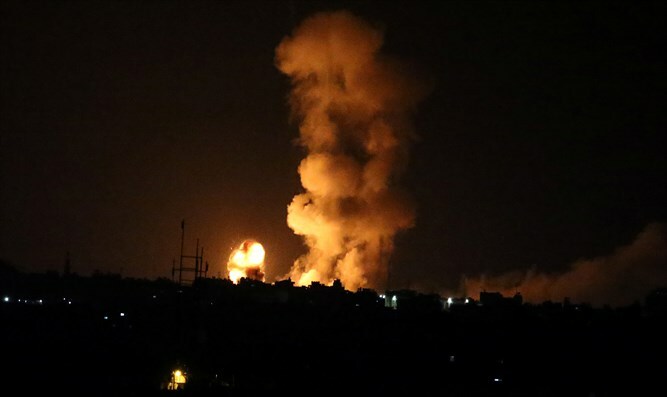 The IDF attack followed nine fires that broke out in the Gaza Belt region as a result of incendiary balloons fired from Gaza. In addition, violent disturbances were recorded in two locations along the border. Gaza’s Hamas terrorist rulers have increased the so-called “March of the Return” protests in recent days. On Friday, more than 10,000 Gazans rioted along the security fence with Israel. They threw grenades and explosives and attempted to infiltrate Israel. Grenade shrapnel hit a combat soldier, injuring him. In response, an IDF aircraft carried out several strikes in northern Gaza. On Saturday, IDF aircraft carried out an attack on a terrorist cell that fired incendiary balloons from northern Gaza into Israeli territory.